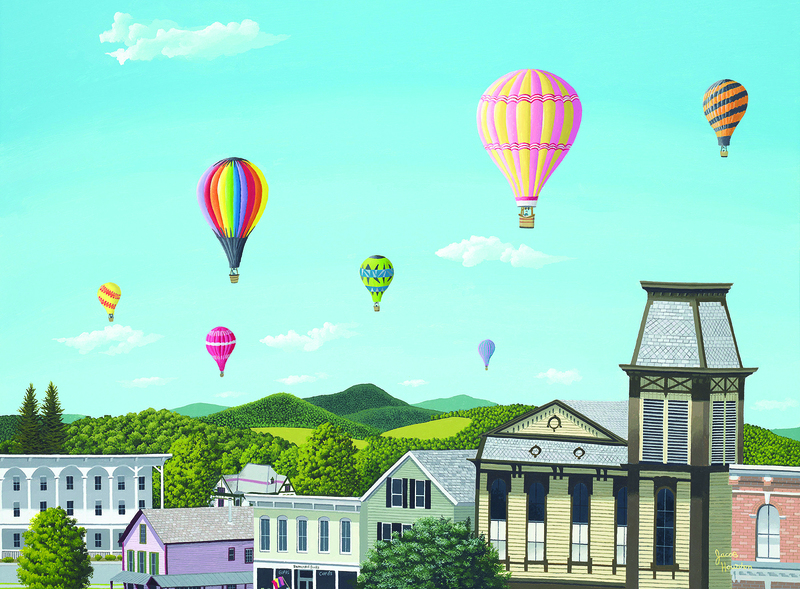 Jacob Houston’s “Balloons Over Cambridge,” an acrylic painting he did in 2017, are among his works being exhibited at The Hyde Museum in Glens Falls through June 23. Nothing seemed extraordinary about the conversations Jacob Houston had with three separate bicyclists who visited his studio during a Washington County studio tour a few summers ago. So when he received a letter a year later from a man who introduced himself as curator of The Hyde Collection—a bicyclist who stopped and chatted with Houston —and asked if Houston might be interested in an exhibition at the museum, the 26-year-old artist was in disbelief. But this month, 23 of Houston’s paintings are on exhibit in the museum’s Hoopes Gallery. “A Magical World: The Art of Jacob Houston” runs through June 23. “Jacob’s open-hearted, joyful view of the world captivated me immediately,” said Jonathan Canning, director of curatorial affairs and programming at The Hyde. Houston won first prize at Lapham Gallery’s first LARAC 120 degrees Intercollegiate Art Competition, competing with artists from colleges throughout the region. His art has also been exhibited in a three-person show at LARAC and in a solo exhibition at Southern Vermont Arts Center. “He treats it as a regular career,” Claire Houston, his mother, said, describing how her son works Monday through Friday at the family’s dining room table. She said Jacob’s love of art and talent for it were evident early on. His evolution as an artist is chronicled in a series of albums she created and proudly displays in the den of their family home.